On the remote and impoverished reservations of the Southwest, residents have few resources for coping when natural disaster strikes. Fires, storms, and water shortages hit Native American families especially hard, because they typically have little disposable income for emergency purchases and very limited supplies in local stores. When reservation communities are struck by natural disaster, SWRA works with our Program Partners to quickly and effectively assist the victims. SWRA is often the first responder, because of our close ties with each community, our warehouse inventory, and our dedicated drivers and delivery systems. SWRA can quickly mobilize emergency supplies such as bottled water, juice, baby food, formula, diapers, cleaning supplies, paper plates, cups, napkins, food items, clothing, blankets, and medical supplies such as bandages. In 2015, SWRA responded to the San Juan River contamination which spilled pollution into the Animas River, a main water source for the Navajo Nation helping three communities in Arizona and New Mexico, and over 14,000 people. 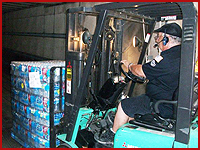 Within days, two truckloads of emergency drinking water had already been delivered! These 40 pallets of water would serve Navajo residents in the Four Corners Area. Hand sanitizer was also included. Volunteers, working under the direction of local Program Partners, sorted the relief supplies and distributed them to those in need. Another shipment soon followed. SWRA was prepared to deliver additional water and needed provisions, if requested. This is only one of many Southwest emergencies we have responded to over the years. While it’s impossible to predict exactly when and where such natural disasters will occur, SWRA knows they will happen. With the help of compassionate people like you, we remain ready to respond whenever Southwest Native American people in need call out to us. SWRA also assists homeless shelters on the reservations, along with shelters for the aged, disabled, veterans and others, benefiting thousands of Native Americans who call these facilities home.